GoldenEye 007 is a stone cold classic, even if modern TVs and wobbly N64 controller joysticks do it few favours. Credited by some as a vital release for the FPS genre on consoles, it stands as one of Rare's greatest games. Of course, the fact that licensing issues have left it in the annals of history is a pity, meaning we have to dust off our old console and cartridge to enjoy it. Nevertheless it's a popular target for mods, and an upcoming project is bolting it into the mechanics of another FPS classic - Doom. Goldeneye 007 tc is promising a substantial reworking, with the eager modders giving the following details. But there are going to be many changes, such as the heavy use of 3d floors and dynamic lights, advanced weapons, and much much more. Work has commenced and is moving quickly, so expect a demo of the first level by around the end of the month. It's not the first time these games have been blended together, but nevertheless this looks like a promising effort - if you're into this sort of thing. In any case, check it out below - for England? Ha, that's actually pretty sweet. But, it looks more like a mod of Doom that brings a feeling of GoldenEye than it does a mod of GoldenEye that brings a feeling of Doom. Edit: Yeah, I've been informed it's actually a Doom mod that makes it look like GoldenEye. Looks awesome. Isn't it a mod of Doom though? yeah I was thinking that. 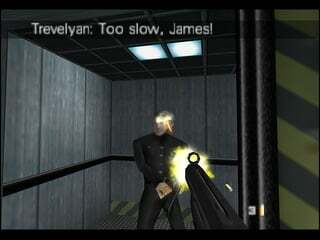 if this is a Goldeneye mod, those guys could of saved a lot of time by going the other way. It is a Doom II mod. The first "via" link is to its mod page. I used to play doom co-op mod's with the 'Aliens' movie theme back in the 90's. This looks pretty fun. Yeah it is obviously a doom mod and not the other way around. Also it looks pretty sweet. Small note of caution to sensitive NLife members: there's quite a bit of rude language and f* bombs in the video, so don't watch if you can't handle that. ~Comic book style cutscenes, similar to action doom 2"
Ok, I see the distinction y'all are making, have tweaked the text a little. Strange that this appears after awaking from a VERY similiar dream to this... Looks really cool. Doom: BFG (Big Fanmade Goldeneye) Edition. Thats awesome as hell! Really liked what i saw from that. Can never go wrong with classic Dooooooooooom! Way to make it sound like its a Goldeneye mod though.. :S got confused at first.